I remember the year I turned ten and my mother handed me a red leather Kahlil Gibran journal that had beautiful quotes at the top of each page. My grandmother had just committed suicide in my childhood home, and my mother knew that writing would help me feel better. My mom was an English major in college and was dealing with her own grief, but as an only child who’d just lost her mother, she found it too challenging to manage my grief in addition to hers. It was the 1960s, and therapy was not commonplace. She figured that a journal would be a good substitute, and she was right. My journal served as a springboard for questions begging for answers, such as why my grandmother had committed suicide at the age of 61, and why my parents wouldn’t allow me to go to her funeral. Instead, they sent me to stay with my aunt and uncle. Writing also led me to ask other meaningful questions, such as, Why was I an only child, and what it was like for my father to have survived the Holocaust? For days on end, I sat in my walk-in closet with clothes hanging over my head, writing in my new journal. I poured my grief onto its pages. Those writing days were also the beginning of my life as a seeker–that is, someone seeking answers to life’s mysteries. As a seeker, I always found that writing helped me pose and answer some of life’s most important questions, such as those related to my life purpose, destiny, and how to tap into my passions. These questions inspired me to look for the messages of my heart–which came to serve as a source of growth and transformation. I wanted to understand the reasons why certain things happened. In essence, losing my grandmother led me down a path of self-discovery. Writing also allowed me to tap into questions about my soul’s quest and my own mortality, and helped me come face-to-face with my periodic bouts of depression. Coincidentally, my grandmother had also been a writer. Years after her passing, I found her journal, where she wrote about her tormented life as an orphan, and “an unwanted child,” during World War I. After reading her words, I realized that we’d shared many parallel experiences and emotions, which led us both to become seekers. Seekers are often those who have experienced either physical or psychological trauma. We become seekers as a way to understand ourselves and the world in which we live. Many writers, especially poets like myself, are seekers. While we may not know why we initially sit down to write, as we do so, answers to unanswered questions emerge, which can lead to healing and transformation. Although I became a devoted seeker after my grandmother’s suicide, I do believe I was probably one even before that momentous event. I was born to an Austrian mother who believed that children should be seen and not heard. As a result, I was often silenced. I had to seek peace and answers from within and from the scribblings in my journal. My seeking might also be connected to my fascination, as a young girl, with reading biographies and magazines such as True Confessions. Real-life stories often provide a deep connection to the kinds of experiences that offer answers to seekers who are posing questions. Some years ago I taught a workshop called “Writing with Lust.” The participants were from all walks of life. I learned that they had one common thread–they all admitted that they were seekers of one type or another. They had questions for which they sought answers and expressed that they were on journeys of self-discovery. Like me, writing helped them on their journeys. Sometimes writing down one’s deepest feelings can be scary, but the results are often worth it. That is, no risk, no reward. 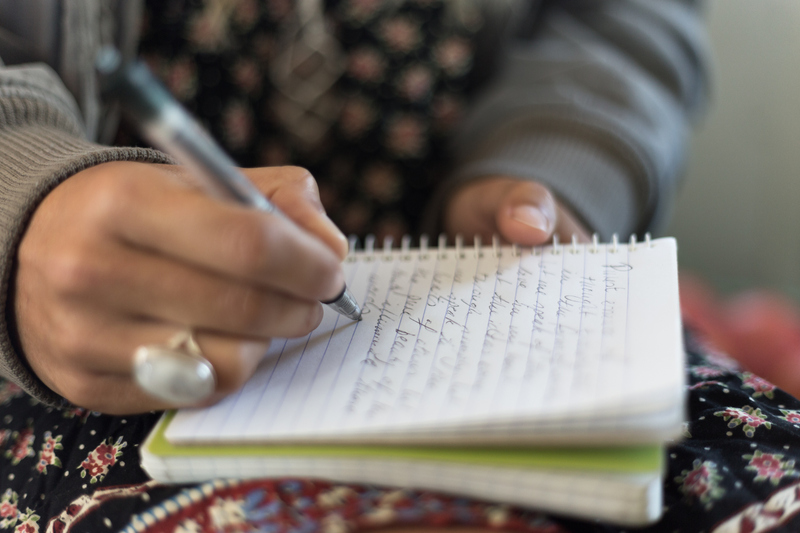 Writing from one’s deep, authentic self leads to healing, growth, and transformation. When I was writing about my grandmother, I realized that for different reasons, both of us were unwanted by our mothers. Seeking to understand why has been a lifelong mission for me, but now that my mother is in the latter years of her life, I have come to understand her better, and, through writing, I have received some closure. Because my grandmother was my primary caretaker, losing her was very painful, and I wrote many poems in her honor. One of the first ones I ever wrote asks why she took her life. It begins: You took your life in the house where we lived together forty years ago. I was ten and you sixty. In the poem, I wrote about how I remembered her. I also thanked her for instilling in me a love for words. By the end of the poem, I received the answer to my initial question of why she’d taken her life: her deep childhood wounds had led to a profound sense of depression. I learned that to be a seeker, you need to be open-minded and consider new ways of thinking and doing. This means opening your mind to examine who you are, where you’ve come from, and what your belief systems are. It also means pushing yourself to go places and do things that you might not ordinarily do–that is, letting go of fear. Spiritual seekers have a deep sense of spiritual hunger and a need to understand themselves and their motives, as well as those of others. Even though I am a seeker, I’ve realized that I also seek the opportunity to share my stories with others, which helps them navigate their own journeys. Spiritual seekers are not necessarily religious. Most often, they have little interest in organized religious practice. In fact, studies have shown that 33 percent of Americans are spiritual and not religious in the more traditional sense. What would you like to do that is outside of your comfort zone? Is there something you’ve worked hard for and poured your soul into, and then you decided you wanted nothing to do with it? Why do you think this was the case? You may find that by being a “seeker” who delves deeply into your mind and heart for the answers to the “big” questions, you will find a level of peace and contentment you hadn’t realized before.